The days are getting shorter, the weather colder. 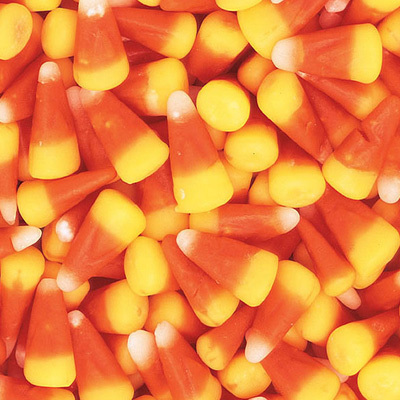 Pumpkins are in abundance and grocery store shelves are brimming with packaged candy. Also to be expected are skeletons and ghosts, jack o lanterns, gravestones on people’s front lawns, ghoulish storefront windows, and, come Sunday, hoards of costumed kids roaming their neighborhoods in search of treats. Halloween has been commercialized for so long that some youngsters may not know that this very American of holidays has cultural antecedents around the globe. For example, the ancient Celtic festival of the dead, Samhain, the Italian All Soul’s Day, the Japanese Festival of Lanterns, Obon, the Mexican Dias de los Muertos, and the Cambodian Ancestor’s Day, Pchum Ben. Common to all of these autumnal festivals is the belief that the souls of the departed return to the world of the living for a short period of time. 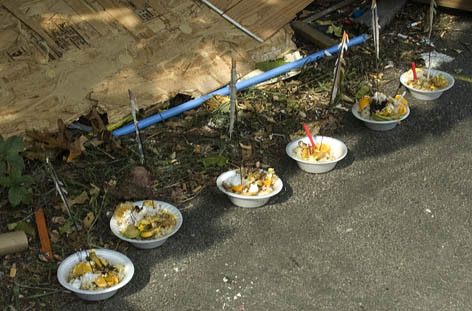 All of them also involve offerings of food. Although Halloween takes place on the last day of October, and Obon in late August, the Cambodian Ancestors’ Day usually occurs in mid-September and lasts for a lunar cycle. The latter, a 15-day observance, is regarded by Cambodians as a time to commemorate and be reunited with deceased relatives. It is an especially important day for those with bad karma who have yet to be reincarnated and are trapped in the spirit world. Search the internet and this desciption by Vathany Say pops up from 2003 on the Khmer Institute website: “Before sunrise on the morning of the Kann Ben [the 14 days leading up to Pchum Ben], special food is prepared for the ancestral spirits to enjoy. Favorite dishes of various flavors and colors are offered. They range from the simple and traditional nom ansom (sticky rice wrapped in banana leaves with assorted fillings) to the more elaborate and rich amok (steamed fish fillet marinated in a complex mix of spices and herbs). This description of Cambodian foodways associated with Pchum Ben was written about contemporary practice in Cambodia, but it could easily apply to ritual practice here in the United States. Indeed, we observed just this sort of alimentary offering in the shaded area of the parking lot of the Triratanaram Temple in North Chelmsford, Massachusetts. 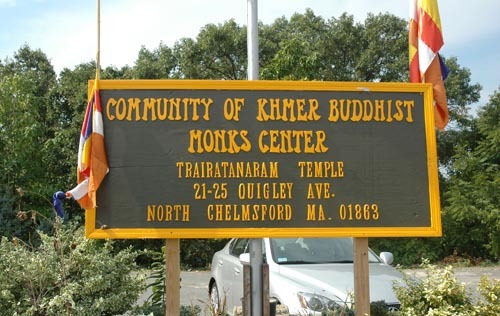 Founded in the 1990s, Triratanaram temple is home to Buddhist monks in the Merrimack Valley and is an important place of worship for the Cambodian community of Greater Lowell. We had come to view the stupa which had been built for the Triratanaram Temple by Yary Livan and Samnang Khoeun. “Like vampires?” I ask. “Yes. During this time, they let them out from the underworld, before sunrise. You call for them. 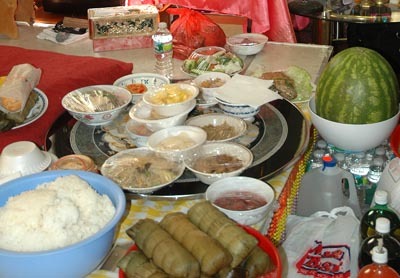 The food is an offering to the dead – a way of placating them so they won’t cause you harm.” Indeed, these poor souls, known as Priad spirits, are said to fear light and can only recieve prayers, food, and be reunited with their living relatives during the darkest day of the lunar cycle, which is the day of Pchum Ben. 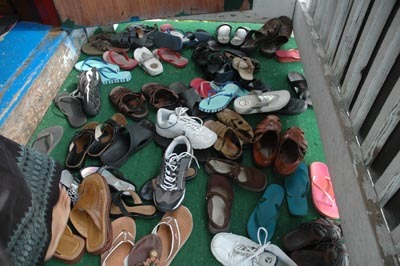 Removing our shoes, we enter. Inside are monks and nuns and laity, sitting on the carpeted floor facing the abbot, Venerable Sao Khon Dhamathero. Many of the women wear white blouses adorned with delicately embroidered white scarves. The chanting and prayers were loud. 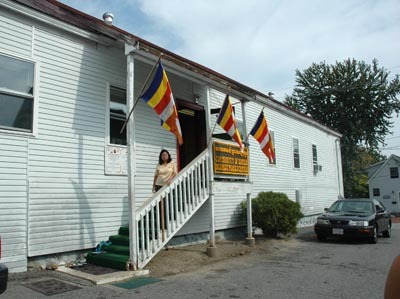 It was difficult to hear Maya and Samnang explain what was going on and what things meant. The sweet, pungent smell of incense filled the air. 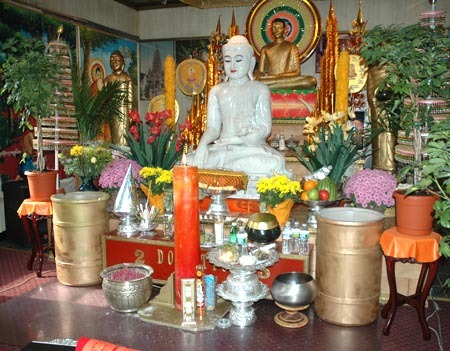 At the altar were several statues of Buddha besides the main marble one from Burma. Behind this large Buddha was a round disk emitting colored flashes of light. Below, an assortment of food and liquid offerings included cooked rice, mushrooms and coriander, bananas, a bottle of ginger ale, and a Starbucks Frappuccino coffee drink. 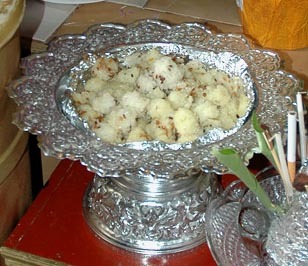 A metal bowl was filled with 49 rice balls – symbolic of the 49 days the Buddha fasted before becoming enlightened. 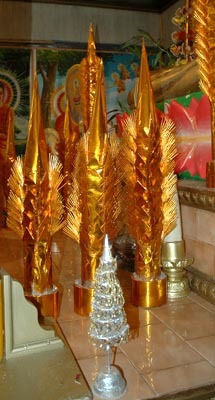 Honey-colored, shiny paper spires reached toward the sky. The chanting and prayers ended soon after noon. We were invited to join everyone for lunch. We accepted, a bit embarrassed to be imposing. 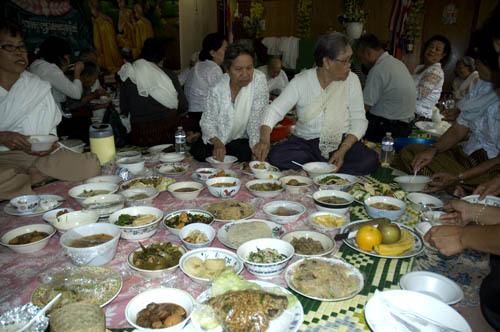 Everyone sat on the floor to eat, circling many bowls of various dishes – noodles, caramelized pork, vegetables, fried banana, banana leaf wrapped around bean paste and sticky rice, and soups. When we left, we were offered a goody bag of sorts – two large gold-colored shopping bags filled with what appeared to be donated food and supplies: a box of Yogi cereal, a huge bag of low-fat potato chips, flavored instant coffee, toothbrushes, toothpaste, Motrin, Dove soap, and a loaf of packaged bread. All items had been blessed by the abbot. Leaving with the overflowing bags was an uncanny reminder of trick or treating, but with a Cambodian twist. All photos by Maggie Holtzberg, 2010.